CHICAGO (AP) — A couple of costly errors at third base over the weekend contributed to Miguel Andujar being the designated hitter the last two games. There’s no issue with the 23-year-old’s bat, though. Andujar homered and singled in the go-ahead run in the 13th inning, Sonny Gray won in his first relief outing since 2013 and the New York Yankees beat the Chicago White Sox 4-3 on Tuesday night. 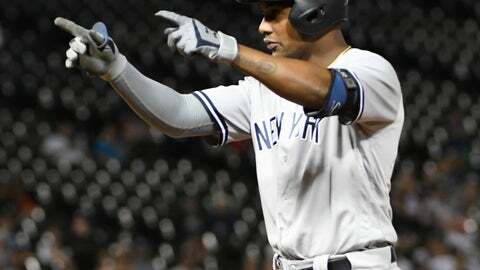 Andujar had three hits, and Giancarlo Stanton added a two-run shot as New York won its second straight following a five-game skid that included four losses at AL East-leading Boston. Whether it’s third base or DH, Andujar said it doesn’t matter as long as he’s in the lineup. “I’m going to play whatever position the manager decides to put me in,” he said through a translator. Gray (9-8) pitched three scoreless innings in his first appearance since losing his spot in the starting rotation. He allowed a hit and a walk while striking out four. Gray hadn’t come out of the bullpen since his rookie season with Oakland. After Stanton’s homer made it 3-1 in the 10th, Jose Abreu hit a two-run homer against Zach Britton in the bottom of the inning. Abreu’s homer was his 20th this season, making him the 18th player with least 20 homers in each of his first five seasons. Andujar’s homer leading off the seventh tied it at 1.